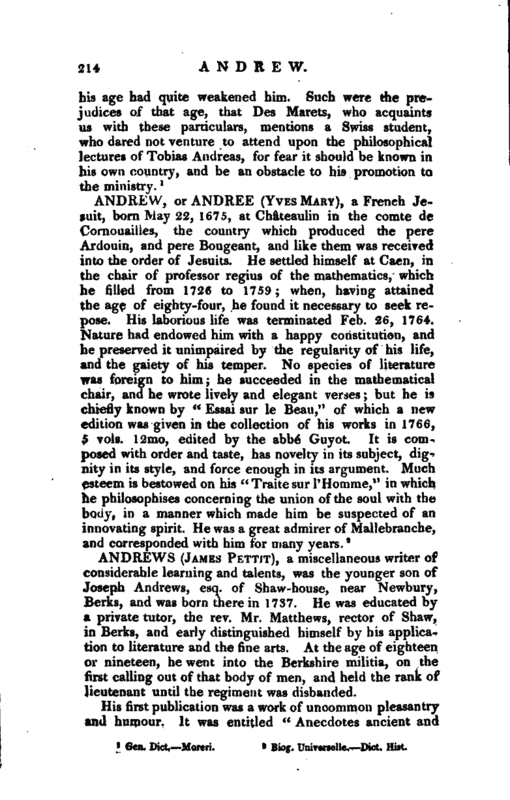 , a miscellaneous writer of considerable learning and talents, was the younger son of Joseph Andrews, esq. of Shaw-house, near Newbury, Berks, and was born therein 1737. He was educated by a private tutor, the rev. Mr. Matthews, rector of Shaw, in Berks, and early distinguished himself by his application to literature and the fine arts. At the age of eighteen or nineteen, he went into the Berkshire militia, on the first calling out of that body of men, and held the rank of lieutenant until the regiment was disbanded. His first publication was a work of uncommon pleasantry and humour. It was entitled “Anecdotes ancient and | modern, with observations,” 1789, 8vo, and a supplement to it, 1790. This went rapidly through several editions; prefixed is a portrait, bearing some resemblance to himself, of a man distilling anecdotes from an alembic. This was designed by Mr. Andrews, drawn by Grimm, and engraved by Macky. The volume is inscribed to his brother, sir Joseph Andrews, and he acknowledges having received assistance from Mr. Pye, the present laureat, captain Grose, and others. 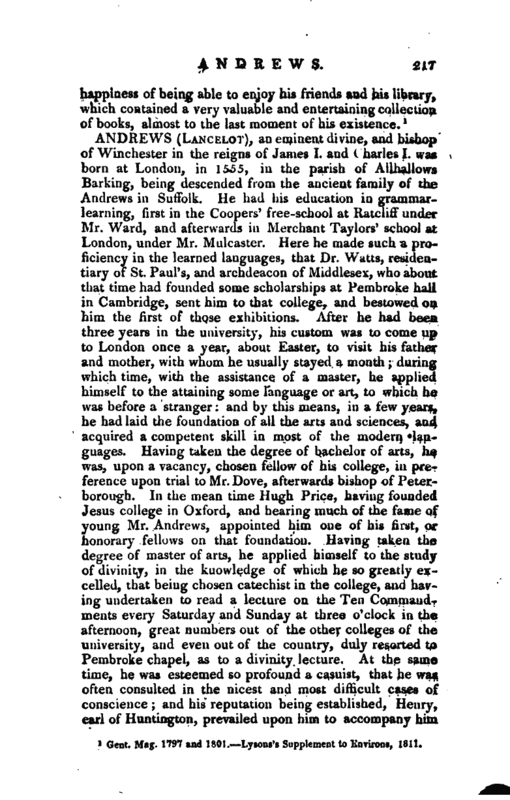 In the same year he is said, but we believe without authority, to have written a small pamphlet, entitled “Advice to the Prince of Wales.” His next work was entitled “The History of Great Britain, connected with the Chronology of Europe; with notes, &c. containing anecdotes of the times, lives of the learned, and specimens of their works, vol. I. from Caesar’s invasion to the deposition and death of Richard II.” 1794, 4to. In this work he proved himself a very accurate and industrious collector of facts, the result of a long course of diligent reading. Throughout the part of the work which is strictly historical, the histories of England and of the rest of Europe are carried on collaterally, a certain portion of the former being given in one page, and a corresponding portion of the latter on the opposite page. The English story is concisely told, with a careful attention to the insertion of minute circumstances. The corresponding page of general chronology is extended to comprehend the annals of every European state, but seldom wanders into other parts of the globe, except when led by circumstances closely connected with the affairs of Europe. In order to condense as much matter as possible into his volume, he carefully avoids unnecessary amplification, and expresses himself with a happy, yet forcible brevity. The notes contain a great variety of curious and amusing particulars not immediately connected with the main story. 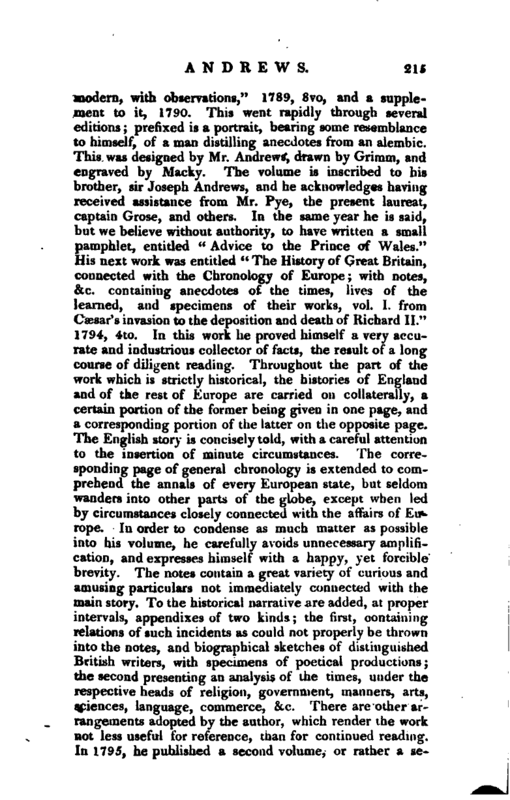 To the historical narrative are added, at proper intervals, appendixes of two kinds; the first, containing relations of such incidents as could not properly be thrown into the notes, and biographical sketches of distinguished British writers, with specimens of poetical productions; the second presenting an analysis of the times, under the respective heads of religion, government, manners, arts, sciences, language, commerce, &c. There arc other arrangements adopted by the author, which render the work not less useful for reference, than for continued reading. In 1795, he published a second volume, or rather a | second part to vol. I. continuing his plan from “The deposition and death of Richard II. to the accession of Edward VI.” It is much to be regretted that he did not live to co nplete this plan. It may, indeed, be undertaken by another, but there is always a certain portion of enthusiasm in the original contriver of a scheme, which it is impossible to impart. Mr. Andrews appears to have been for a time diverted from his own work, by being engaged to continue Henry’s History of Great Britain, which was published accordingly, in 1796, in one volume 4to, and 2 vols. 8vo, and formed an useful supplement to the labours of the Scotch historian, but one more corresponding to Henry’s plan is yet wanting. Besides these elaborate works, Mr. Andrews displayed his antiquarian knowledge in “An account of Saxon Coins found in Kintbury church-yard, Berks,” which was printed in the 7th volume of the Archæologia; “The account of Shaw,” in Mr. Mores’s Berkshire Collections. He translated also “The Savages of Europe,” a popular French novel, illustrated with prints from his own designs. To the Gentleman’s Magazine he was a very liberal and intelligent contributor. 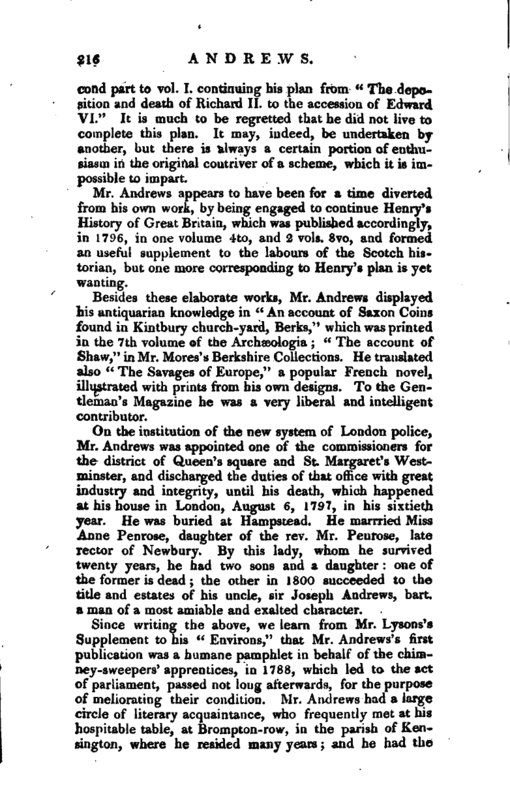 On the institution of the new system of London police, Mr. Andrews was appointed one of the commissioners for the district of Queen’s square and St. Margaret’s Westminster, and discharged the duties of that office with great industry and integrity, until his death, which happened at his house in London, August 6, 1797, in his sixtieth year. He was buried at Hampstead. He marrried Miss Anne Penrose, daughter of the rev. Mr. Penrose, late rector of Newbury. By this lady, whom he survived twenty years, he had two sons and a daughter: one of the former is dead; the other in 1800 succeeded to the title and estates of his uncle, sir Joseph Andrews, bart. a man of a most amiable and exalted character. Gent. Mag. 1797 and 1801. Lysons’s Supplement to Environs, 1811.